The days are long and warm, and summer has come again to the northern hemisphere. Something both Japan and Canada have in common is the summer festival. Nothing like a bunch of artery-clogging street stalls to make you feel like it really is summer. As a child the midway coming to my city was the most fantastical experience. The tastes, the smells, and the sights were so foreign to me, as was the chance to stay up so late and see all the colours of lights in the sky. I loved the ferris wheel! Japanese summer festivals are all about the fireworks rather than midway rides. But those colourful explosions as well as the yukatas and jinbei worn out on summer festival days provide just as much colour as a midway. Somehow Yayo was able to capture the excitement and visual sensations of both the Canadian midway of my youth and the Japanese fireworks festival of my children's. 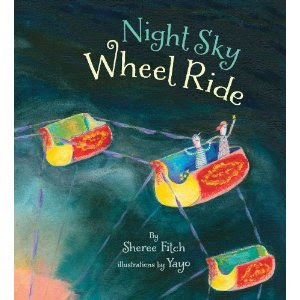 His amazing imagination makes us see so many things in the ferris wheel, from cocoons to bathtubs for mermaids or a druitful apple tree. He manages to capture the fantastical without venturing into weird. Fitch's poetry is evocative and appropriately challenging for the new reader (See out to sea, sister). The beautiful arrangement of the text gives us an extra layer of imagery as shapes are built into her sentences. This is an amazing and imaginative read that is perfect for a sultry summer good night read. This is the forty-third book I have reviewed for the Sixth Canadian Book Challenge. A new one is starting Monday, sign up soon! This looks like a great book! Added it to the "to buy" list!